– Products for industry: MSc ESC Energy Storage Converter, UMD-AC Motors UPS, DC Supplies, Battery Chargers, Ultrasonic Generators, Static AC/AC Converters. 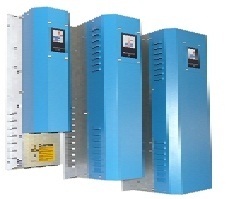 – Products for railway: Battery Chargers, DC/AC Inverters. – Products for Power Plants: Automatic voltage regulators (Exciters), Uninterruptible AC-motor drives (UMD) for sluice gate systems and flood pumps, Uninterruptible power supplies for control rooms, Converters (regenerative) for distributed power generation, Uninterruptible blade pitch control for wind mills.